Wednesday is yet another Fed meeting where we get to hear “policy” from them. So many times in the past, the upcoming meeting has been called “THE” most important meeting ever. This one is being called the same thing. I have mentioned more than a few times in the past six years “what can they really say?” I’ve done this because the Fed never had any choices. Do they have any choices now and for this meeting? Let’s look at what they can do, what they cannot do and what they shouldn’t do. The first option is for the Fed to do nothing and not even change what their mantra has been for so long by remaining “patient”. If this is their choice and I suspect it should be, the question then begs whether the markets will remain patient with the Fed? An impatient market place would presumably cast their vote in the Treasury and dollar markets amongst others. Another option and the one the press wants you to believe is the Fed will do nothing, but with a caveat being the Fed actually hints at the June meeting as their target date to begin tightening. I am not sure about this one because the markets will react by front running the Fed. Let me sidetrack for a moment and point out how front running was initialized during Alan Greenspan’s era. It used to be the Fed would meet and decide policy, and then implement it. Market participants needed to decipher by Fed actions whether they were tightening, loosening or what the policy decision was, and then place their bets. (Mr. Greenspan changed this deciding to “spoon feed” the markets and actually say what their policy was). It was in this manner the Fed truly kept people guessing and more “cautious”. Caution was thrown to the wind when the Fed began making policy statements after each meeting. I am convinced they did this because they knew by announcing an easing of credit, it would be “front run” by the markets and thus the heavy lifting done by the market. In other words, the Fed could jawbone and let the market do their work for them. This works (worked) quite well during the easing cycles, it doesn’t work so well if the Fed needs to tighten. You see, the markets are now so levered, any front running of a tightening cycle will turn into an outright panic overnight. This is the problem. The Fed CANNOT actually tighten, they cannot even put a date on a tightening. The only thing they can do is say “we are gonna gonna gonna tighten” but never say when. They have well over a $4 trillion balance sheet that must, but can never be wound down or liquidated. The financial markets have been a one way street where the Fed could either do nothing, or accommodate more, tightening has been off the table for nearly 10 years. Were the Fed to tighten to any extent now, the dollar will move even higher, setting losing carry trade positions even further offside. Consumer consumption represents about 2/3rds of the U.S. economy. No matter what you look at, actual consumption, inventories or new orders, they are all in decline. The last two times all three series went negative in unison the U.S. was already well into recession. Tightening credit now will not only blow up the financial markets but also take the real economy with it. You see, the real economy need help, not a headwind. Were the Fed operating with a clean slate and the Treasury a clean balance sheet, the argument today would not be whether or not the Fed was going to tighten, it would be the reverse, whether they were going to or already EASING! 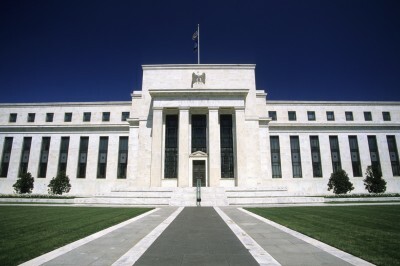 The Fed is cornered …and it is of their OWN DOING! Lastly, this meeting has a lot to do with “credibility”, or in this case, the lack of. This meeting is important because the Fed stands to lose ALL credibility because of the space they have painted themselves into. They need to actually ease and begin QE4 to soothe the markets (more importantly the real economy) but all they have done is talk about “when” they will begin to tighten. Six years worth of “medicine” has clearly not worked, can the Fed really admit this? They surely cannot reverse their talk of tightening and instead dispense more medicine …can they? Clearly the recent economic numbers argue the economy at best is treading water and is flat lined. Even the Fed’s own growth model shows a .3% growth rate for the first quarter. Add on top of this the dollar’s strength as the euro implodes and European banks begin to fail (two in just the last 10 days in Austria which were AAA rated). Does the Fed really believe they can tighten and press the dollar even higher? Without blowing up markets and derivatives? Can they really believe blown up derivatives will not affect our own banks …which are not exactly healthy? While I am not saying the Fed “cannot” tighten, because they can do anything they choose, if they do put a date on it we will not reach that day without a panic. The markets will front run any tightening because in effect it will be a margin call …ON EVERYTHING! A margin call with no free margin available I might add. To finish I would like to mention Eric Sprott’s latest interview with King World News. http://kingworldnews.com/billionaire-eric-sprott-just-made-the-most-terrifying-prediction-of-2015/ He is concerned about the markets going into collapse where we see a “no bid” scenario. In my opinion he is quite correct, but this is only half of the equation. The other half will be gold and silver going “no offer”. The danger with this scenario is your avenue for insurance will be closed. As I’ve mentioned over the last couple of days, and since we are discussing “options”, I believe the Chinese will ultimately have no other option than to re mark gold into the stratosphere in order to recapitalize themselves and their banks. Any such action will put the no offer scenario front and center even if you are able to afford the new price of gold. The Fed is now faced with the scenario of not having any options left, yet they must make a choice. They are damned whatever they do… and little time to do it. Hopefully this is something you calculated into your own actions before arriving at such a “choice”!